The Russian political class has come to love Trump wholeheartedly, and are happy to share this love with the whole country. The souvenir kiosks at Moscow’s Sheremetyevo International Airport carry a T-shirt with Donald Trump gazing into the distance and the logo “I Love Russia” in Russian and English. Business picked up after the Helsinki Summit, and they’ve had to restock. The influence of politics on mass culture is ubiquitous. The opposite is also obvious: Politics is showing traits of show business, which used to be inappropriate. Today’s public does not seem to expect considered programs and strategic proposals (which many simply never read) so much as vivid gestures, catchy phrases, and quick reactions. That is, qualities that are needed by showmen, and which now help politicians win. A show not only imposes a format, it also appeals to irrational feelings instead of critical reason and imposes a surrealistic image of the world that has nothing to do with reality. This is strikingly evident in the way mainstream Russian media and the political class reacted to the recent Helsinki Summit. “He loves Russia” was the main message given to the Russian public. While other Western leaders criticize, accuse, and interfere in the resurrection of Russia’s grandeur, Trump simply loves Russia, her president, and her political class. Love is irrational—it does not follow reason. Everyone can understand it. “I love Russia” says it all. It’s hard to say when the Russian political class came to truly believe this. The propaganda people, judging by TV, have been under this euphoric misapprehension since the early days of Trump’s campaign. They have come to love him wholeheartedly, and are happy to share this love with the whole country. Trump’s election a year ago was hailed by our Congress with ovations and champagne, a first in Russia’s young parliamentary history. Television and most of the state-run media created the image of Trump as a true reformer, embodying the desires of American people, as unlike the hypocritical Democrats and lying liberal press with its nagging reminders of human rights and values and rules. Columnists persistently equated the American and Russian liberal press, which criticized the regime in both countries and acted as “internal enemies.” No information was given on the fact that there were differences between the American and Russian political systems, press, and societies or that half the country did not approve of Trump. But associative parallels were encouraged. Trump in the production of the Russian dream factory basked in the people’s love (as did Putin in Russia) as the defender of the interests of the working class and average Americans demeaned by political correctness. Leaving international agreements and violating rules were interpreted as independence, disregard for expert opinion as dignity. His appointment of “hawks” to the administration, the introduction of harsh anti-Russian sanctions, and even the fact that the absence of coordination of the two countries in Syria has led to a dangerous confrontation were barely mentioned in the Russian media. The main message was that hostile lobbies in Congress are keeping the president from his course. But he loves Russia anyway! The official press coverage of summit preparations made it clear that the Russian political class not only did not see reality but did not want to. Most analysts and political talking heads presented Trump as the firm and tested defender of Russia’s political interests. “Trump is ready to recognize the Crimea as Russian,” “Trump has been preparing all his life for a meeting with Putin” were headlines that interpreted Trump’s words very loosely. They even managed to interpret “America first” as meaning parity with Russia. That is, a patriot thinks about America first, but also respects his partners. And loves Russia in every case! No one ever said that Trump sees Russia as on an equal footing with North Korea and that his voters certainly don’t see Russia as an equal partner. The Russian news show 60 Minutes (not related to the American show) devoted an hour to the summit. The host, known for her hostility to the liberal “fifth column,” practically wept with joy. The most precise formulation of the official position of the summit was expressed by Chechen leader Ramzan Kadyrov in his blog—Russia has come out of international isolation, parity has been recognized, a new era has begun in international policy, decided by two countries and two leaders. Even the experienced diplomat Sergey Lavrov, minister of foreign affairs, said the summit went “better than super!” The general delight drew attention away from the fact that it was hard to know if any agreements had been achieved. The certainty that our beloved American president “loves Russia” was not shaken either by the fact that Trump repudiated his own words or by the possibility of new anti-Russian sanctions. 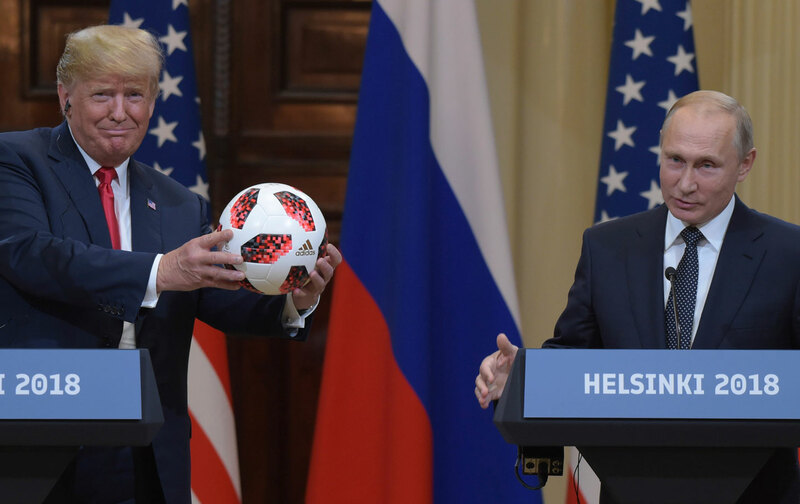 On the eve of the Helsinki Summit the independent newspaper Novaya Gazeta printed a translation of the open letter signed by American intellectuals, activists, and writers, published on July 11. More than 25 authoritative public figures—including writer and feminist Gloria Steinem; Jack Matlock Jr, former US ambassador to the USSR; Katrina vanden Heuvel, editor and publisher of The Nation; political analyst Noam Chomsky; writers Walter Mosley and Alice Walker; filmmaker Michael Moore; professor emeritus Stephen Cohen; former governor and ambassador Bill Richardson—called on the American leader and American politicians to seek common ground with Russia in order to safeguard common interests and prevent a nuclear war. It was a reminder of the most important thing—the danger of nuclear tragedy remains and politics without rules only increases it. This is an extremely important text that brings us out of the showbiz world back to reality. I hope that Russian intellectuals will pick up the conversation, for the time is now. Nadezhda AzhgikhinaNadezhda Azhgihina is a longtime journalist and Director of PEN Moscow.